Give Your Locs A Clean Start #2!! Greetings, Blossoms! I did a post on giving your locs a clean start a few months ago and wanted to revisit the topic. 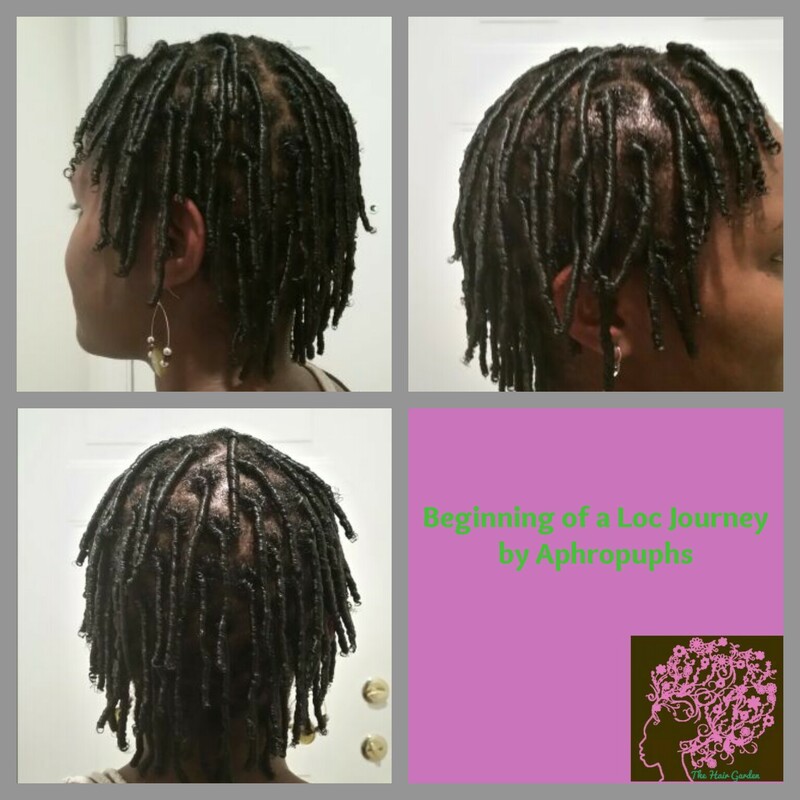 I had a client whose locs I had recently started and would be maintaining so I will be able to journal her progress and give you a closer look at my loc maintenance routine! Like I said in my prior post, Give Your Locs A Clean Start, I believe in cleansing/shampooing regularly during the locking process. On a whim, I decided to film the parts of the re-twisting process that I could so you could see how it all works! This first video shows the clients new growth since her last visit with me about 3 weeks ago. She was even able to shampoo one time on her own between visits! The next video is her hair after being shampooed and conditioned with Hair Garden products. I started her locking process on 6/2/2015 ad you can already see some budding beginning around mid-length of the loc. Notice how the hair is meshing together even after it is freshly shampooed and free of product! Here is her hair all twisted and ready to go under the dryer! A view of the side. 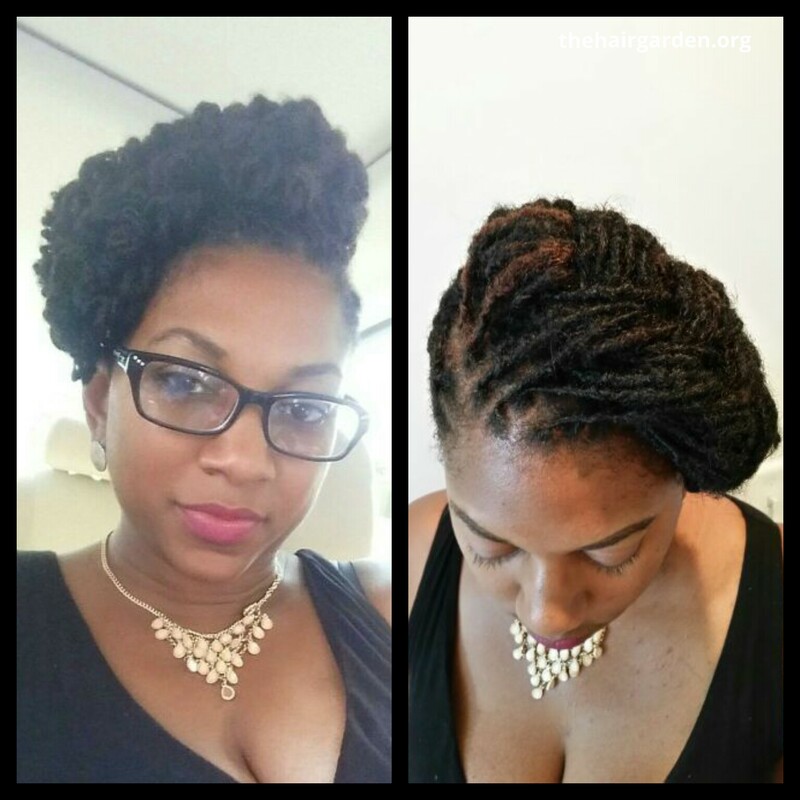 This last video shows the final results of the loc re-twist. I re-twisted her hair using Hair Garden’s “Herbal Tea” tree-tment and a small amount of EcoStyler. I let her sit under the hair dryer for about 20-25 minutes and then removed the clips. It takes about a week before the twists begin to frizz again and look a little messy. Within 2 to 3 weeks, it is time for another cleansing and retwisting! My future videos will be a lot better because I finally invested in a tripod!! Feel free to ask any questions below!! 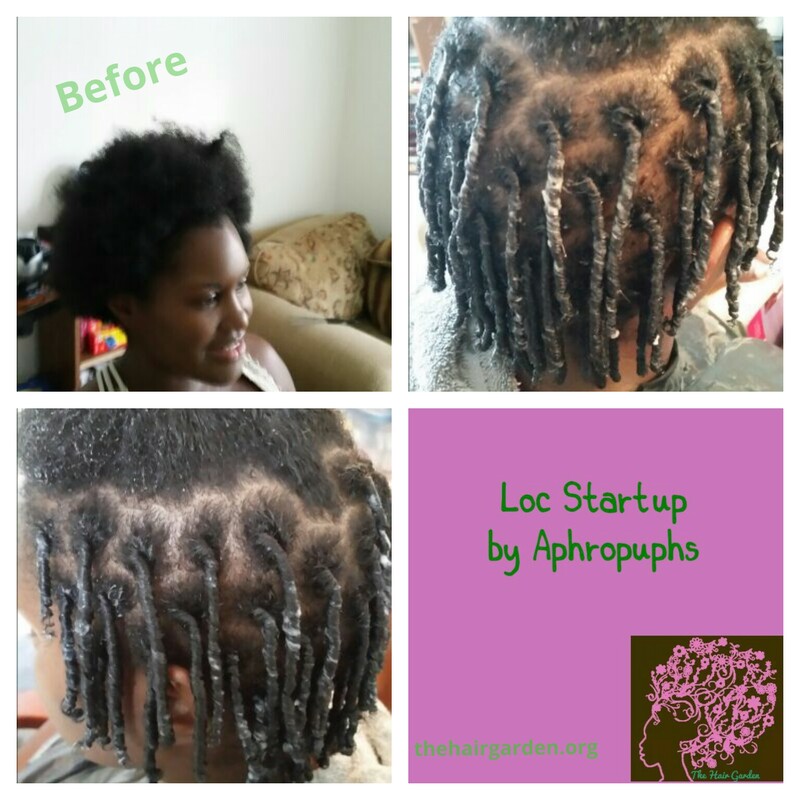 Author AphropuphsPosted on July 13, 2015 June 25, 2018 Format VideoCategories Hair Care, Loc CareTags afro hair in locs, beautiful locs, clean locs, conyers loctician, conyers natural hair, conyers natural hair stylist, early stages of locs, loc care, loc maintenance, loc retwist, locs, loctician, natural hair, shampoo for locs, shampooing locs, shampooing new locs, the hair garden2 Comments on Give Your Locs A Clean Start #2!! 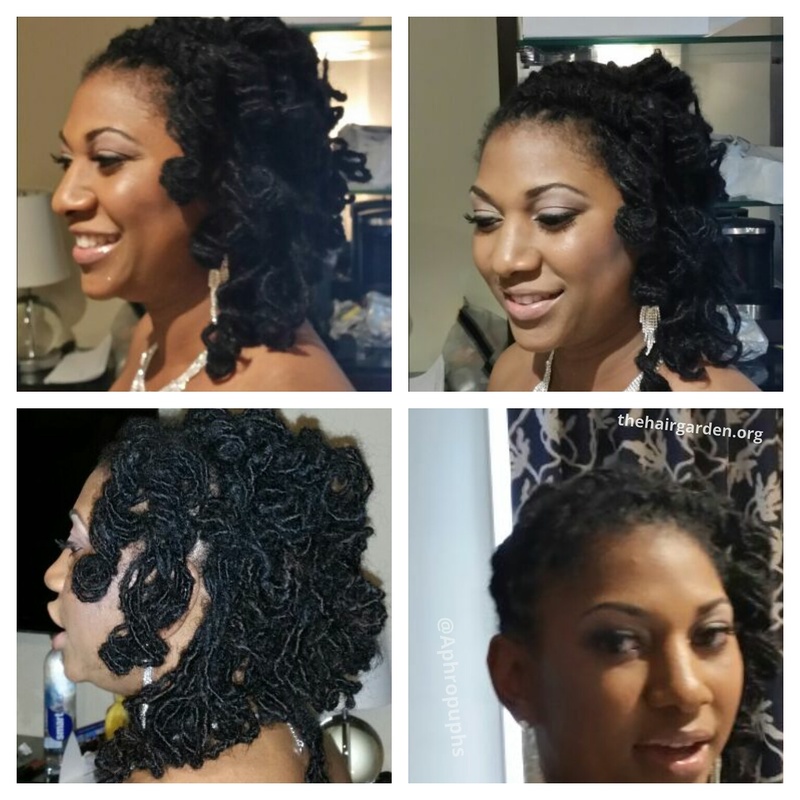 Braided Loc Updo: 1 Style, 2 Beautiful Options! Hi, Lovelies! 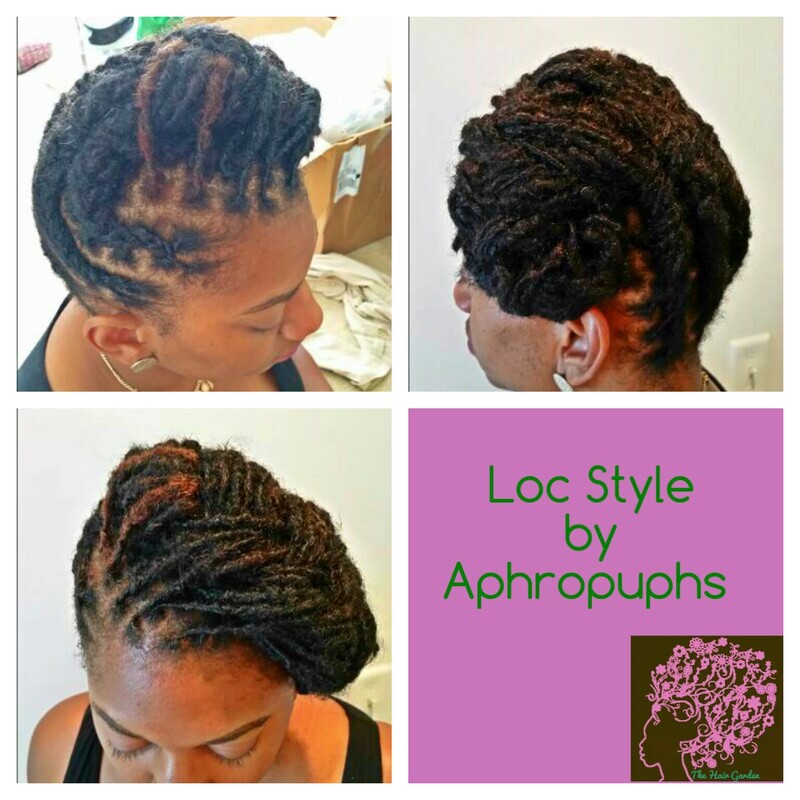 I want to share a loc style that I did over the weekend with you! I was able to create 2 great looks out of one style! I added a little color throughout to highlight her beautiful locs. I then shampooed and conditioned this Blossoms locs with Hair Garden’s Cleanser and Mango Punch Conditioner and used the “Herbal Tea” Tree-tment on her scalp and new growth during the re-twisting process with an occasional dab of EcoStyler. She sat under the warm dryer for about 45 minutes for we began styling. 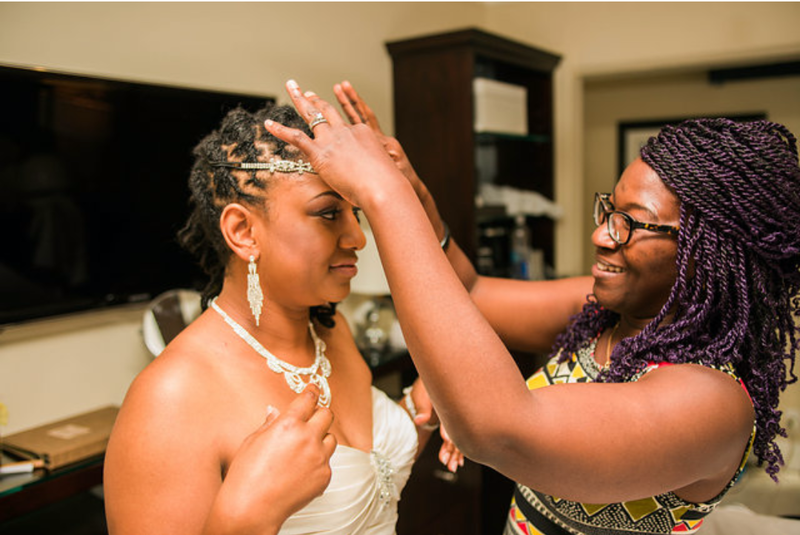 The locs were braided up diagonally and pinned at the crown of the head with some left draping at the sides. I over-hand braided that hair and pinned it at the bottom. Additional styling option: The braid in the front can be taken down later for a wavy effect on the locs! Look #2 is my favorite! 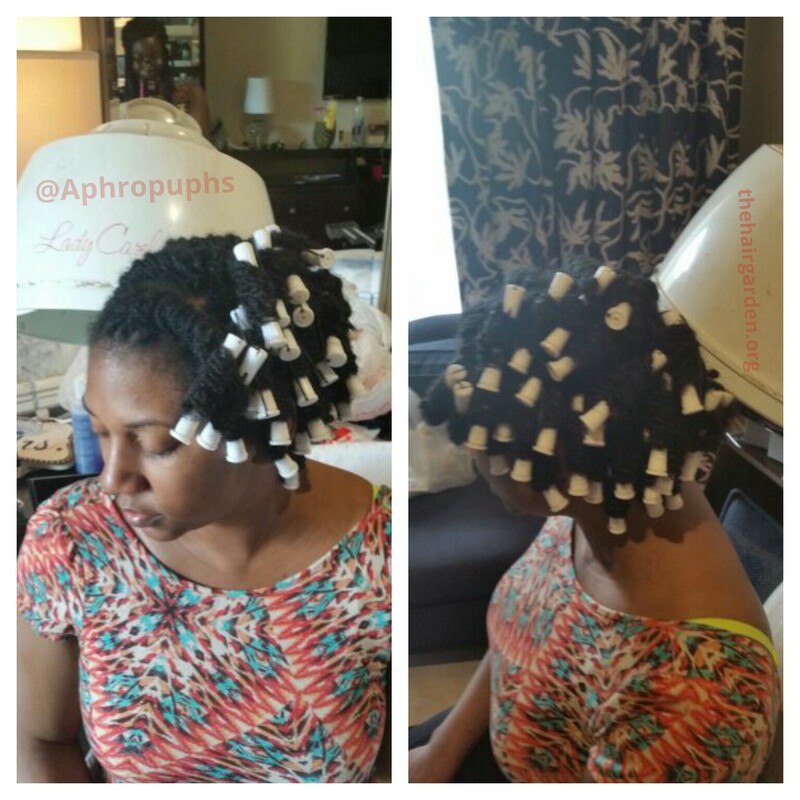 The locs were dampened with water and I added a little setting lotion before wrapping them on small perm rods. We could not find the color pipe cleaners we needed so I went with this beautiful alternative. She sat under a warm dryer (medium heat) for about 45 minutes. I removed the rods and pinned the curls so they were secure and not dangling. Additional styling options: Remove the hair pins for longer, looser curls. It can also be pinned up entirely into a curly bun! 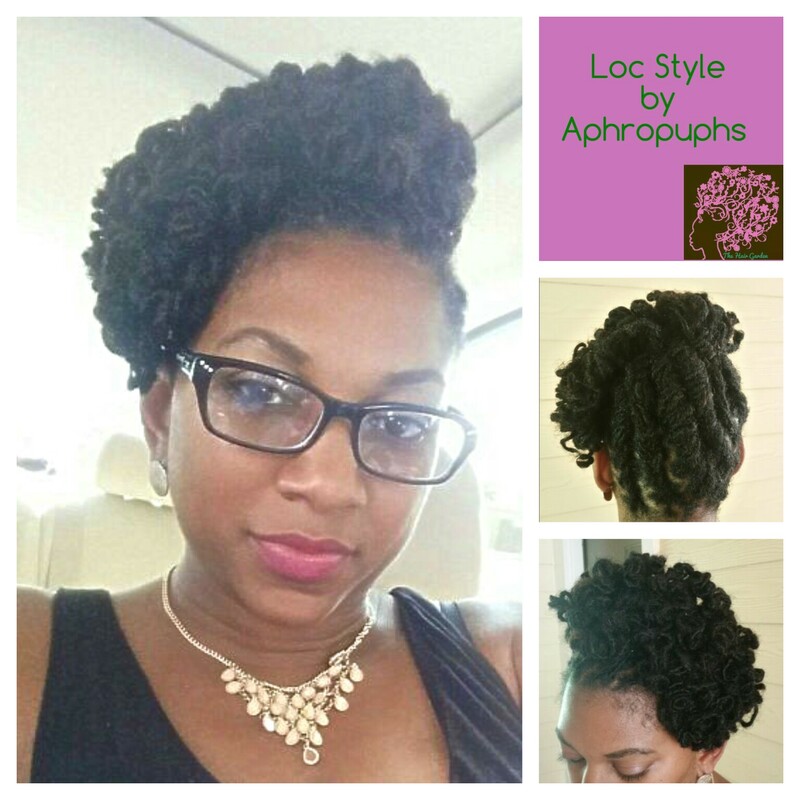 Author AphropuphsPosted on June 8, 2015 Categories Hair Care, Loc Care, Natural HairstylesTags afro hair, beautiful locs, black hair, braided locs, loc hair styles, loc hairstyles, loc styles for women, locs, natural hair, natural hairstyles, perm rods on locs2 Comments on Braided Loc Updo: 1 Style, 2 Beautiful Options! Greetings! Today I had the privilege of starting locs for a client.This lovely lady has been natural for a little over a year and had always longed for locs! Her hair and scalp were in healthy condition and ready to begin the locking process! Before we got started, I shampooed her hair with Hair Garden Cleanser and Conditioned with Mango Punch. I mixed some Herbal “Tea” tree-tment in a spray bottle to maintain moisture during the twisting process an a quarter sized dollop of EcoStyler Gel. I then sectioned and secured her hair to begin! The process was quick and easy. It only took me about an hour and a half and she was on her way out of the door! 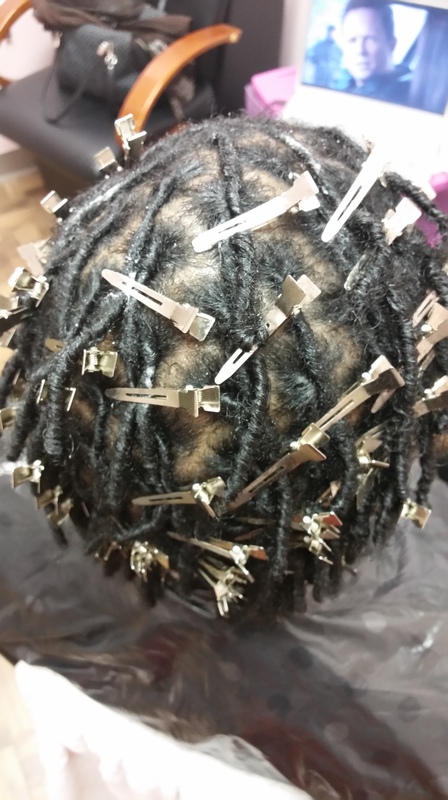 She will be ready for a freshening and re-twist in 2-3 weeks. In between visits, she can keep her scalp clean with witch hazel or aloe vera. When she returns I WILL shampoo her hair. I cleanse locs on every visit during the locking process. I am excited about her beginning her locking process and a glad to be part of it! I have started many heads locs and feel the save love for them all! 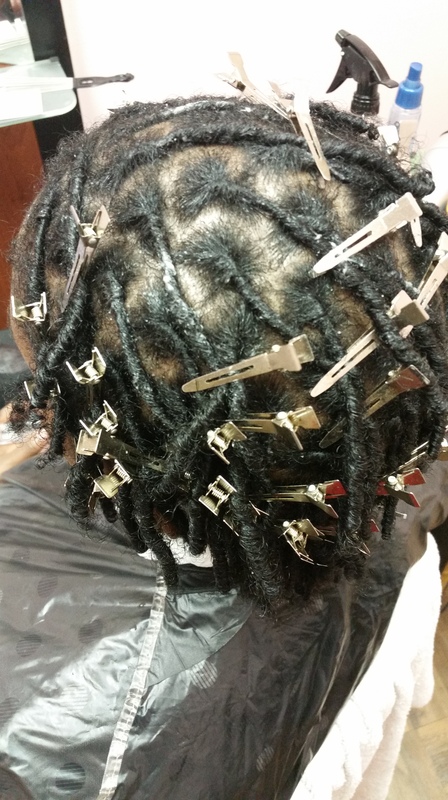 I always take it as a personal honor when someone asks me to begin their loc journey for them. 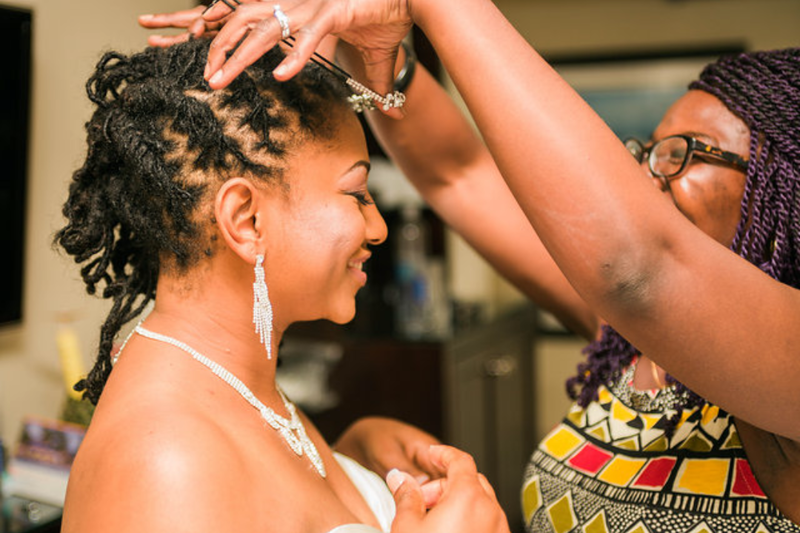 It is the “birthing” stage of their locs and how they are started and maintained will determine the health and final look of your locs! 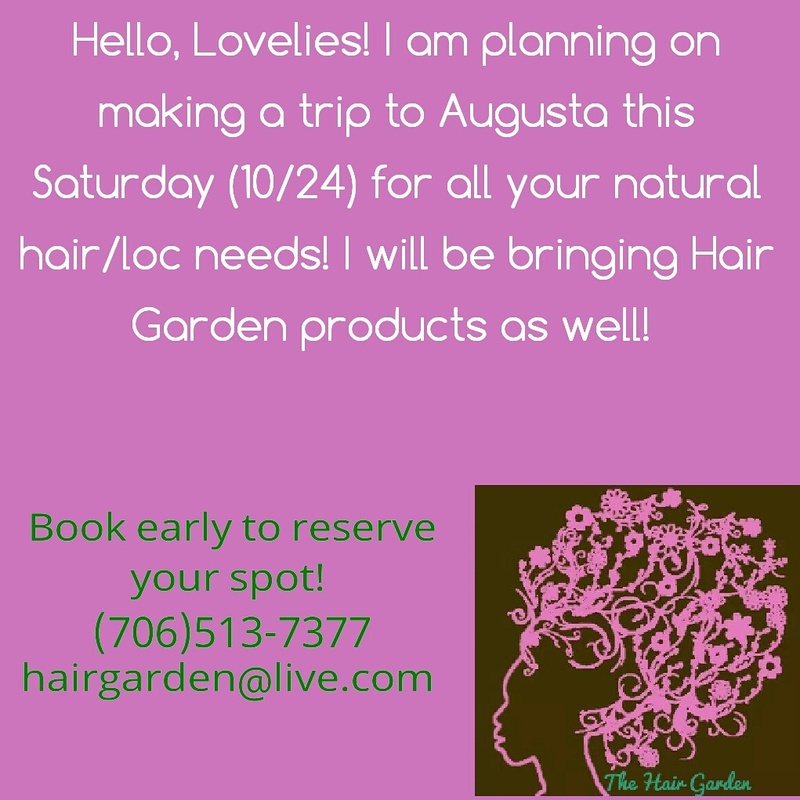 I love styling natural hair and am a proud advocate for it. Over the years I have witnessed and helped transition so many beautiful women into their natural hair. They were all at different points in their journeys and all had different reasons for wanting to go natural. One of the most reoccurring factors was abnormal hair loss. 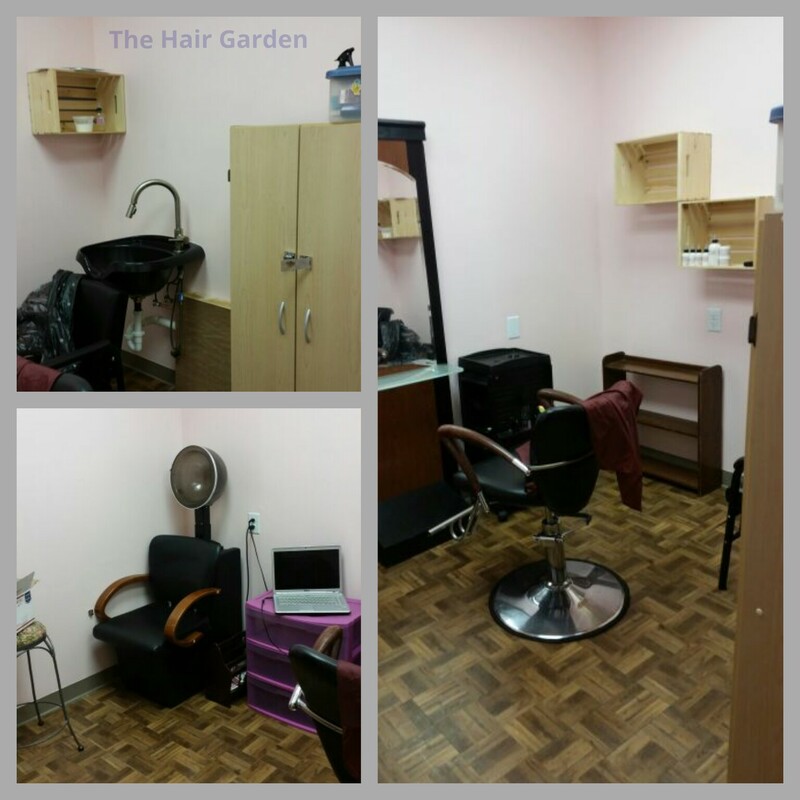 Certain types of hair loss is what encouraged me to develop the Hair Garden products that I had been using on them. Alopecia, pronounced “ah-lo-pee-she-ah”, is generally defined as abnormal hair loss that can be caused by a variety of reasons. There are so many different types of alopecia that affect people. Some can be treated and cured while there are others simply cannot and will proceed until there is complete hair loss. There are several different types of alopecia affecting people but there is one in particular that I would like to discuss today. 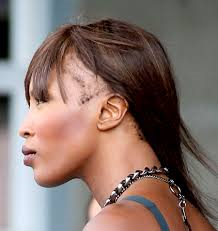 Traction Alopecia – This is caused by excessive and repeated stress on the scalp and follicles. Things like tight ponytails and braids, rough combing, impatiently removing hairstyles like braids and extensions. Even frequent friction from things like caps, headbands and headrests can accelerate hair loss. When the hair strand is prematurely forced from the follicle you feel pain, right? Maybe even see a drop of blood? This is because the strand is attached to a dermal papilla where there is blood flow and nerve endings. This is where the physical hair growth starts. Right above that is where your sebaceous glands and follicle opening are. 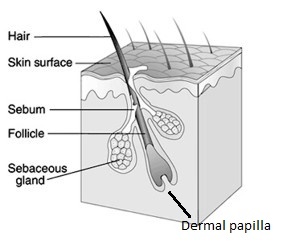 When the hair is forced out of the follicle, it becomes inflamed. The area swells from the trauma and to aid in protecting against infection. This irritation causes us to scratch which opens the area and exposes it to infection. This is when you get the small pus bumps that resemble whiteheads. This type of constant trauma and infection to the follicles is not healthy and does not provide a good environment for healthy growth. This sometimes can lead to the follicle shutting down completely and skin growing over it leading to permanent hair loss. The hair can be completely restored from this type of alopecia IF the trauma being placed on the scalp and follicle stops! Before I go any further, I want to stress how important it is not to style children’s hair in very tight hairstyles! This type of trauma on the follicles while they are still developing (see insert article) can cause irreversible damage and even resulting in permanent hair loss! Just imagine how that could affect their self-esteem in their adolescent and adult years! Simply tame that developing hair, don’t restrain it!! This type of alopecia can be avoided by going to an experienced braider that can properly apply the correct tension and/or use the right amount of hair extensions for your hair type and texture. Proper style maintenance can definitely help. This includes wearing the style for a reasonable amount of time, properly cleansing, and adequately lubricating and moisturizing the hair! I personally feel that it is important to keep the scalp clean when wearing protective styles for an extended amount of time. The follicles are under stress when they are in a pulled hairstyle and you don’t want all types of external debris invading and possibly clogging it. If you would rather not shampoo/cleanse, opt for a dry shampoo, witch hazel, apple cider vinegar, aloe vera gel or some type of gentle astringent to clean the scalp. Also, stimulation to the scalp is greatly beneficial. This includes steaming, massage and exfoliation. 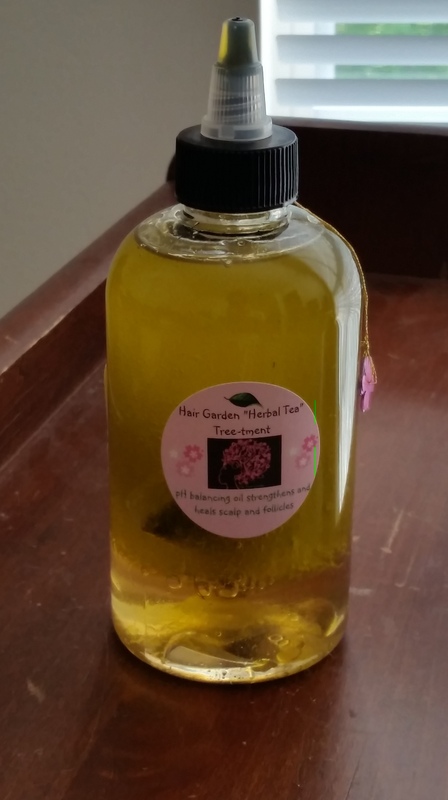 This helps with growth because it stimulates blood flow to the scalp, helps regulate sebum flow, aids in removing dead and excess skin from the scalp and opening follicles. Including these things in your regimen can definitely help restore growth and aid in accelerating slow growth! This is why a developed my Hair Garden “Herbal Tea” Tree-tment Oil. I combined a blend of strengthening, healing and stimulating herbs infused in a blend of balancing, rich and lubricating oils. Many have found this oil very effective with regular use. Especially when used in combination with the Hair Garden Cleanser. I will go over the other common types of alopecia in future posts! I hope you found this one beneficial! Thanks for stopping by! 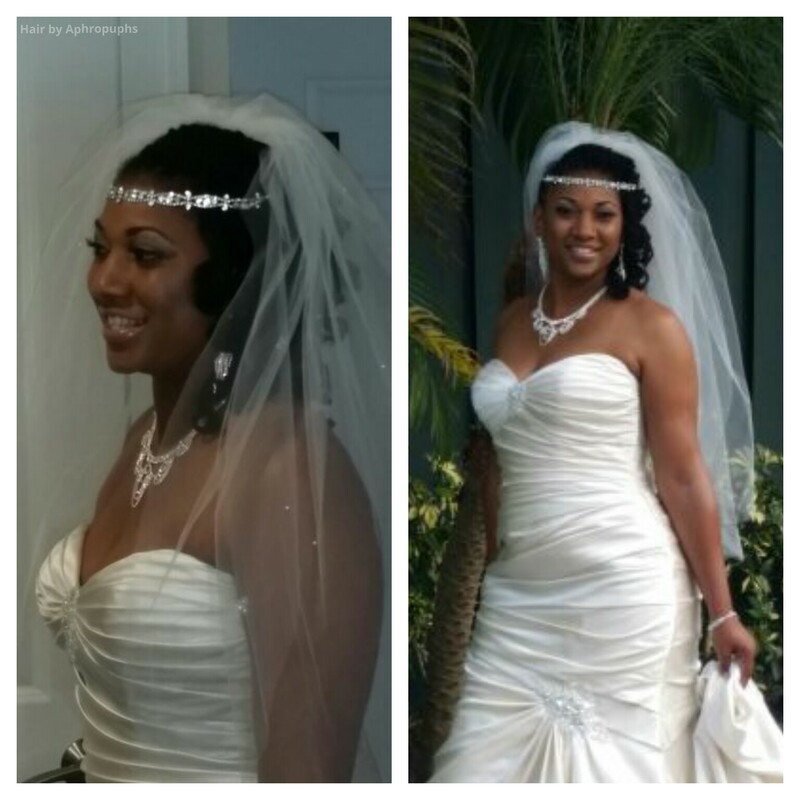 I had the honor of traveling to the lovely Key West to style this beautiful natural bride and personal friend of mine on her special day!! The look was achieved with perm rods, a little water, a little lotta-body setting lotion and 20 minutes under the dryer! I flat twisted her locs up the side and across part of the back allowing them to cascade over her shoulder! I secured the twists with bobbi pins and an occasional small rubber band. 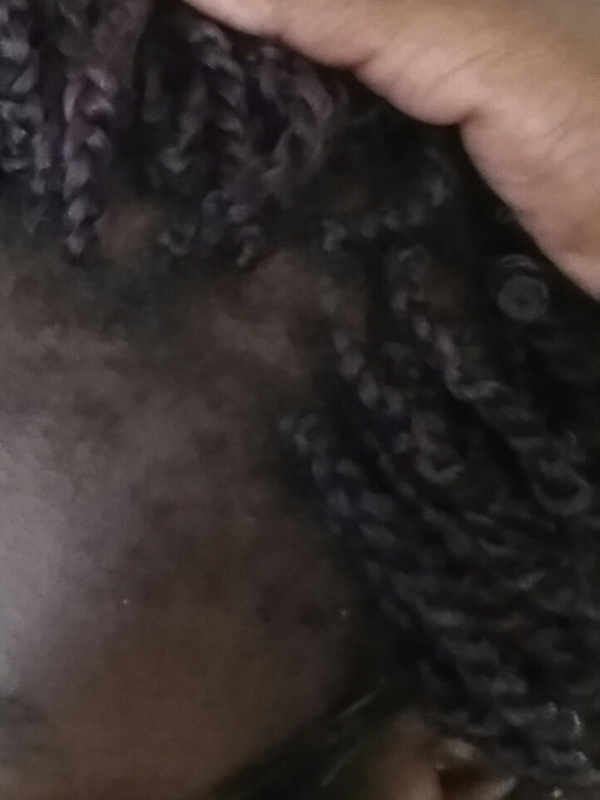 I spiraled 2 to 3 locs per perm rod. 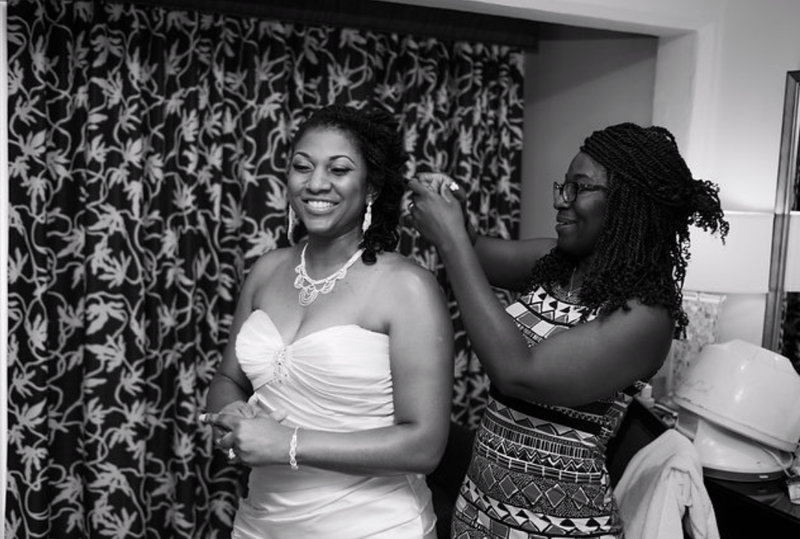 After her hair dried and rollers were removed, I added the adornments the bride selected for her day! It was a beautiful day and I enjoyed helping the bride/my friend get ready! 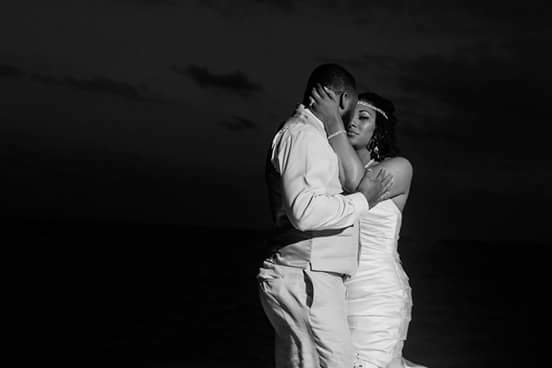 The bride was stunning on her day with a versatile style that she can also wear on the honeymoon! The bride was absolutely beautiful on her day and I was so happy to be there for the celebration of her union! Congratulations to the new couple! Love you guys! !